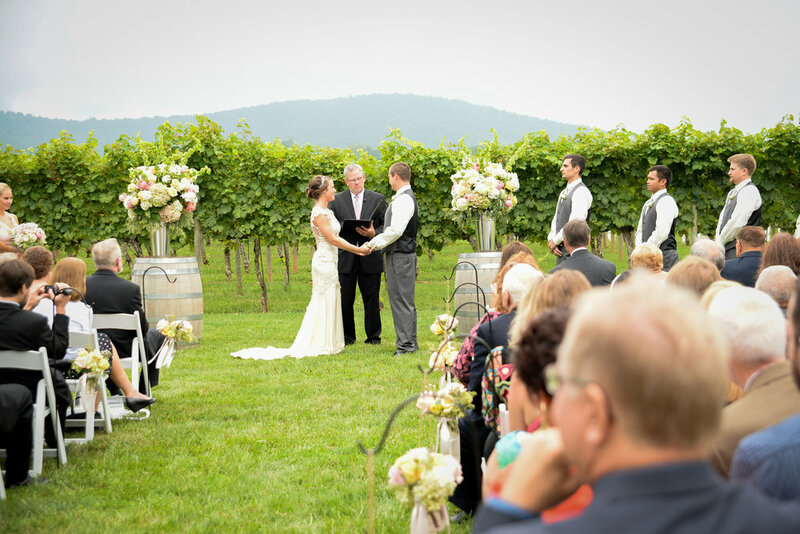 Amy & Michael were married at Keswick Vineyards on Saturday, August 23rd. Mother Nature was playing with us on trying to decide if it was going to rain or not. The decision was made to move cocktail hour under the tent and to go forward with the ceremony outside. Thankfully we were able to get through the ceremony just before a light drizzle started that we couldn't even pick up on the radar. Nothing that heavy, more of a mist, which made the rest of the day/night much cooler and enjoyable. I really like how Amy & Michael had guests sign rocks with marriage advice for them to keep forever. I know when I lived in Florida I would have my guests sign a seashell which I still have in a chest. Amy Webb at Blue Ridge Florals did an amazing job with the flowers along with Pearl's Cupcake with a beautiful dessert table. Thanks to the following vendors for making this wedding a dream come true for Amy & Michael: Caterer Harvest Moon, Day of Coordinator Jennifer Terkel Taub, DJ Dennis Payne, Photographer Steven Inge of Steven & Lily Photography, Blue Ridge Florals, Pearl's Cupcakes, Makeup Artist Deanna Delgado with Bobbi Brown, Hair Stylist Molly Bush with Urban Chair Richmond, Officiant Brian Purcell, Skyline Tent Company and A&A Transportation. Click here to read Steven & Lily Photography blog.